Dates of the latest abolitions of monarchies in Europe and the territories nearby. A green rectangle indicates that the monarchy was restored afterwards and is currently functioning. If a country has no date, it means that either it has never had a monarchical government (e.g. Switzerland) or it has been functioning throughout the country’s modern history (e.g. Sweden, Denmark and Norway). 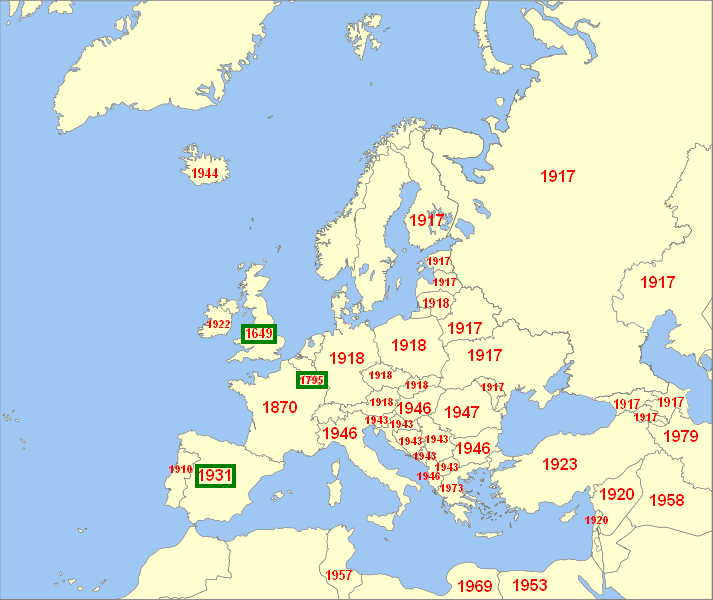 Note that the dates do not necessarily mark the end of the national independent monarchy but the territory it covered (e.g. Ukraine).